Southern sophomore Baylee Wolfe (3) drives baseline past Wahama freshman Victoria VanMatre, during the first half of the Lady Tornadoes 52-35 victory on Saturday in Racine, Ohio. 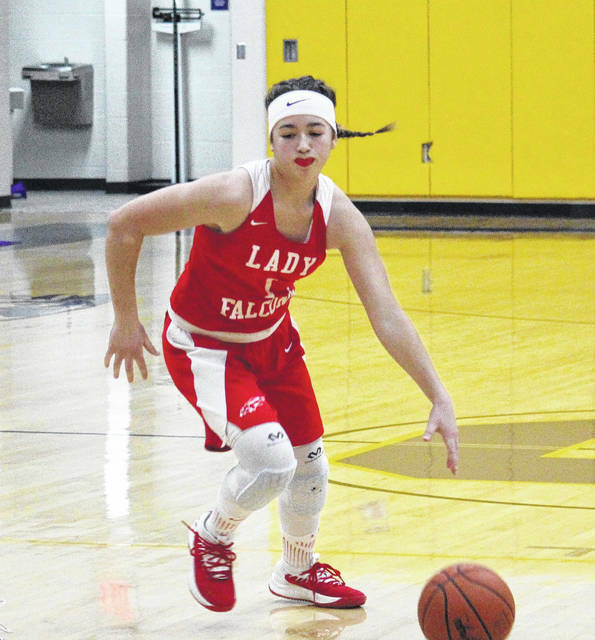 Wahama sophomore Hannah Rose dribbles near the top of the key during the Lady Falcons’ 52-35 loss at Southern on Saturday. RACINE, Ohio — The sweep is complete. 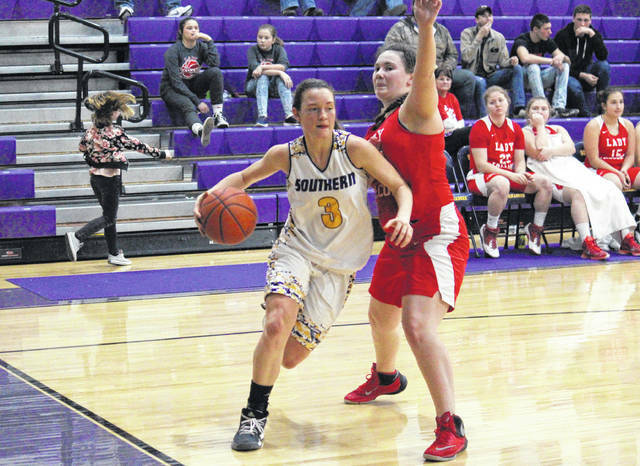 After taking a 52-44 victory over the Lady Falcons on Dec. 14, the Southern girls basketball team finished the season sweep of Wahama on Saturday in Meigs County, winning by a 52-35 count in Tri-Valley Conference Hocking Division play. 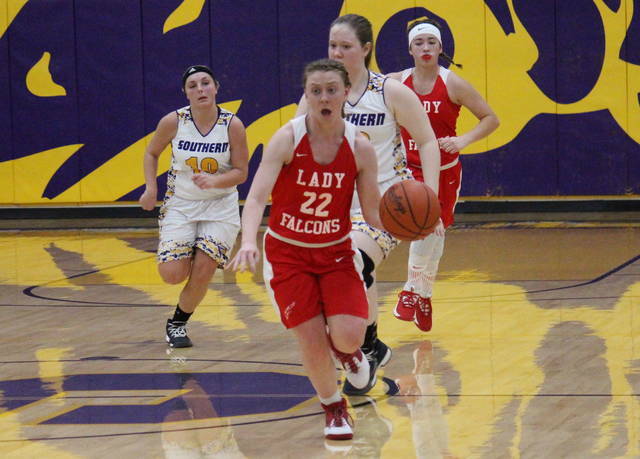 The Lady Falcons (4-10, 2-10 TVC Hocking) claimed a 2-0 lead just over a minute into the game, but surrendered the next six points and never regained the advantage. Southern (5-12, 3-10) jumped out to a 11-5 lead, before the Lady Falcons reeled off six straight points to tie the game. However, the Lady Tornadoes ended the first period with a 7-0 run and a 18-11 advantage. SHS scored the first nine points of the second quarter and led 27-11 with 4:00 left in the half. Wahama cut its deficit to 32-19 by halftime, scoring six of their eight points from the free throw line. The guests cut the deficit to 10 points within the opening minute of the second half, but never got closer. The SHS lead was as high as 17 points in the third quarter, but the Lady Tornadoes settled for a 43-29 edge headed into the finale. The Purple and Gold pushed their lead to a game-high 19 points with 1:22 left in regulation and cruised to a 52-35 victory. For the game, Southern shot 20-of-60 (33.3 percent) from the field, including 3-of-10 (30 percent) from three-point range. Meanwhile, Wahama shot 13-of-56 (23.2 percent), including 2-of-10 (20 percent) from beyond the arc. At the free throw line, SHS shot 9-of-17 (52.9 percent) and WHS shot 7-of-16 (43.8 percent). Both teams grabbed 41 rebounds in the contest, with Wahama earning an 18-to-13 edge on the offensive glass. SHS held advantages of 9-to-4 in assists and 12-to-1 in steals, while WHS picked up a 6-to-1 edge in blocked shots. The Lady Falcons turned the ball over 20 times in the contest, while the Lady Tornadoes gave the ball away just 13 times. 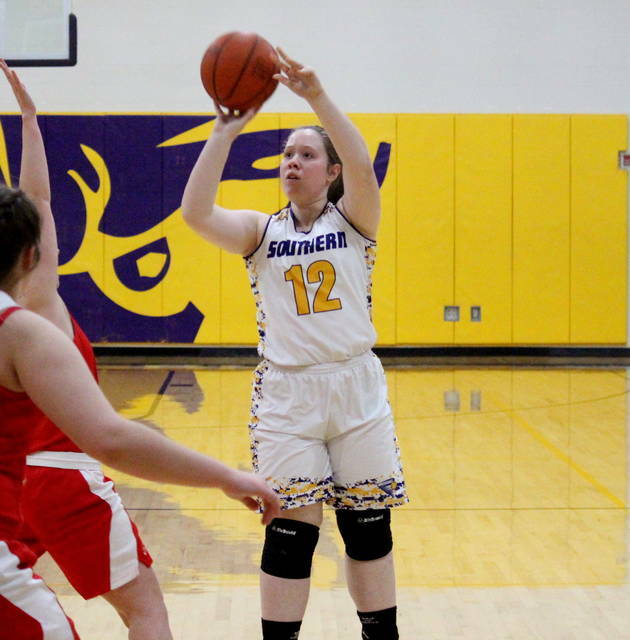 SHS senior Josie Cundiff hit a game-best two three-pointers and finished with 11 points to lead the Purple and Gold. Phoenix Cleland recorded a double-double of 10 points and 12 rebounds to go with a game-best four assists, while Jaiden Roberts came up with nine points. Paige VanMeter hit one three-pointer and finished with eight points, Lauren Lavender chipped in with seven points, while Baylee Wolfe marked five points and nine rebounds. Shelbi Dailey rounded out the SHS scoring with two points in the win. The Lady Tornado defense was led by Phoenix Cleland with four steals, followed by Cundiff with one steal and one block. WHS freshman Emma Gibbs — who paced the team’s defense with one steal and four blocks — posted a double-double for the guests, marking game-highs of 13 points and 24 rebounds. Hannah Rose and Harley Roush each hit a three-pointer and finished with 12 and seven points respectively, while Victoria VanMatre capped off the scoring column with three points. Elizabeth Mullins had two assists for the Red and White. After hosting Eastern on Monday, Wahama will have a week off before hosting Belpre. Southern visits Williamstown on Monday and will then host Athens on Wednesday.